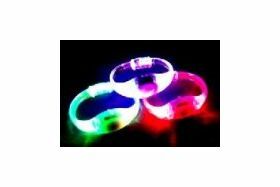 Each flexible bracelet has a sound reactive light in its centre, surrounded by bright LEDs. Your colours will be selected at random. Once the music drops, these incredible Bracelets will flash along to your favourite tracks. 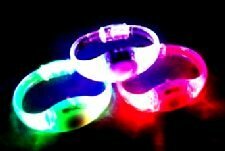 An unbelievable effect can be achieved when the Beat Band is worn by a large crowd of people, for example in a concert audience or nightclub, as the beat of the music makes all Sound Activated Bracelets worn by the crowd pulse together in sync creating a stunning result.